Picking a high potential entry point is half the battle. How do we know what kind of move price is expected to make? Projecting price movement beyond the swing points is the answer everyone seeks. 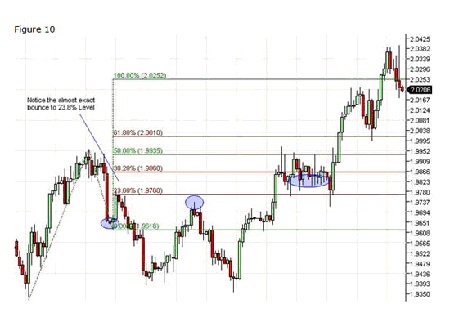 In our first example we entered a long position on the 23.6% retracement from the swing high. How far can we expect the position to run? In Example 3, we identified 3 potential entry points. Now it is time to figure out possible exit points. 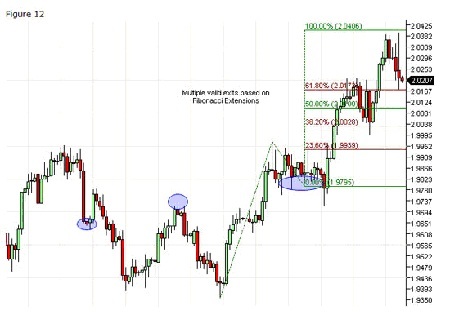 Fibonacci Extensions take into account three price points. 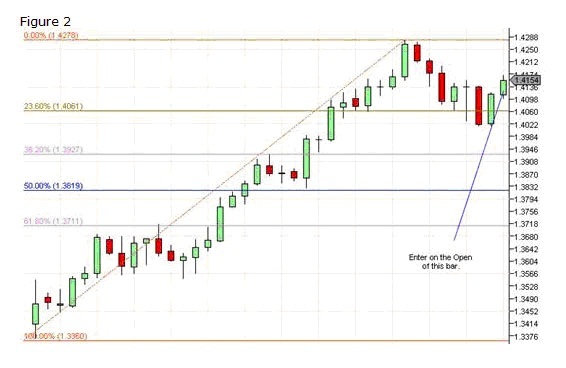 A swing high and swing low, plus the swing point where price reversed from a retracement. 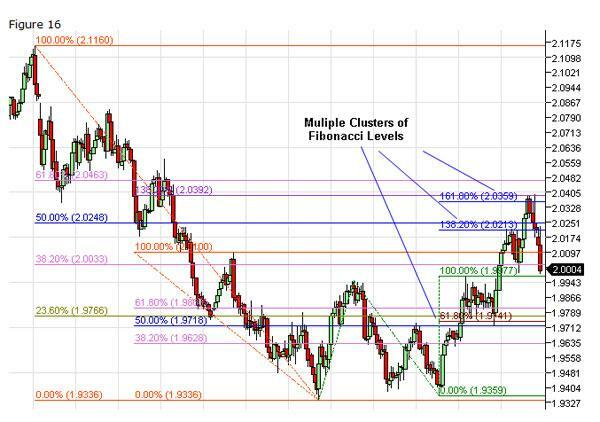 Like Fibonacci Retracements, I use exactly the same set of Fibonacci levels when using Fibonacci Extensions. Letâ€™s go back and look at our first example. 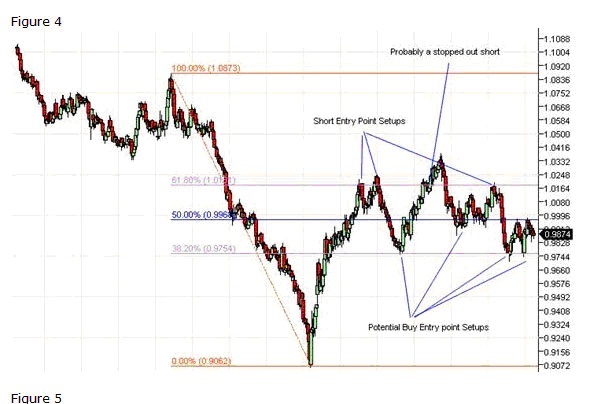 We see in figure 3 the trade could have been a big winner, but how would we figure out potential exit points? Fibonacci Extensions! 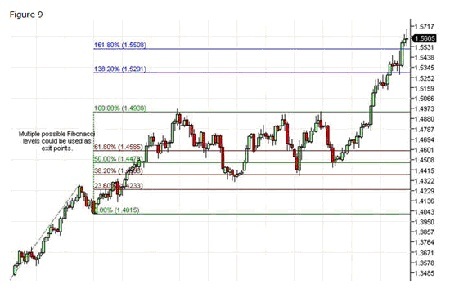 I find Fibonacci Extensions the most useful as a money management tool. The last thing we want to do is turn a winner into a loser. As price moved above the 23.6% level, I would start to bring my stop loss up in trail. Accordingly, I would continue to raise my stop as price increased. 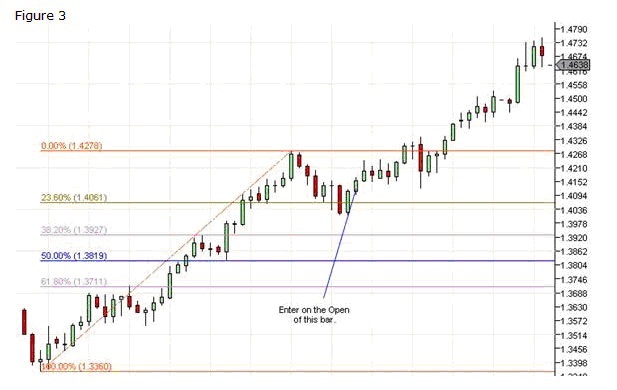 The level of risk is entirely up to your trading plan, but tools like Fibonacci Extensions help identify key levels from which stops can be placed. You can see in the next chart, Figure 9, that after price penetrated the 100% Fibonacci Extension level, we entered into a period of consolidation. While during the consolidation there were obvious entry points, however, remaining in the initial trade would have proven to be frustrating. 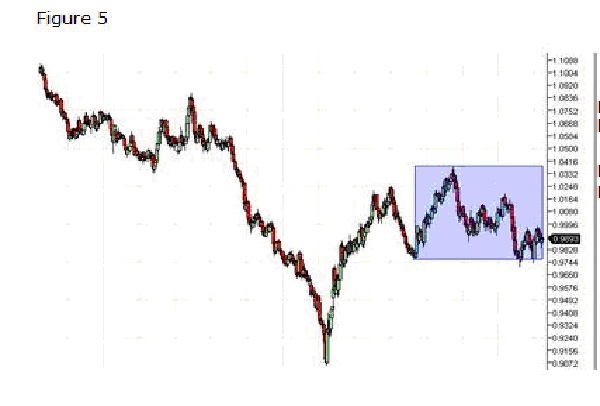 In Figure 7 we found the GBPUSD creating a bottom and breaking out to the upside. We also identified 3 potential entry points. 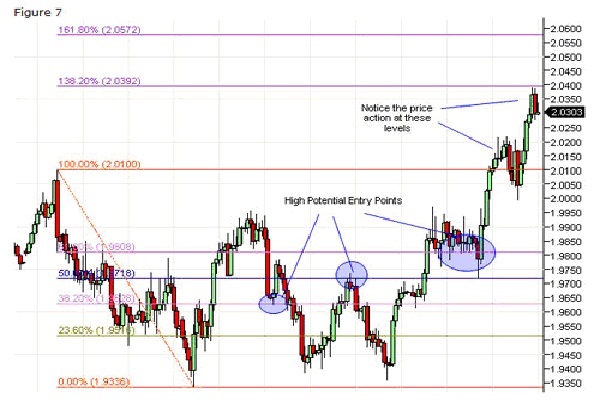 Letâ€™s look at each of the entry points and use Fibonacci Extensions to project profit targets. 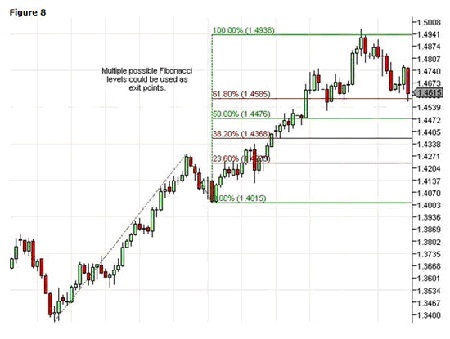 In the first trade we entered the market thinking that a swing low was in place off the 38.2% Fibonacci Retracement level. 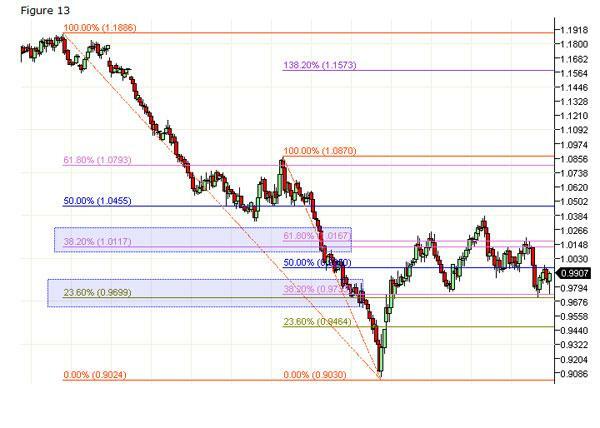 You can see in Figure 10, while price did bounce to the 23.6% Fibonacci Extension level. It was enough to make a profit, but it was not a major winner. 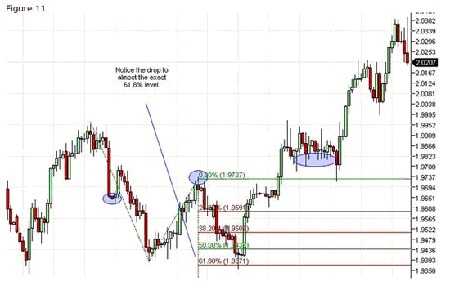 This is a trade that once you did not see a continuation through the 23.8% level, you could have take that as a cue to exit the position. Or at the very least move you stop up to maintain some level of profit. 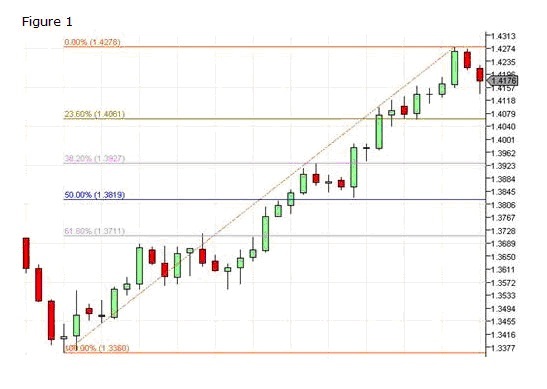 Moving on to the second entry point, we sold short at the 50% Fibonacci Retracement level. This was obviously a solid entry point. On the way down you can clearly see opportunity to tighten up your stop loss values. 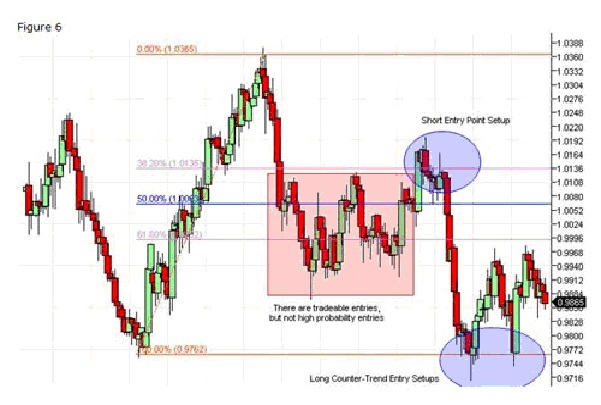 There are many ways to manage a trade like this without being overly tight with your stops. 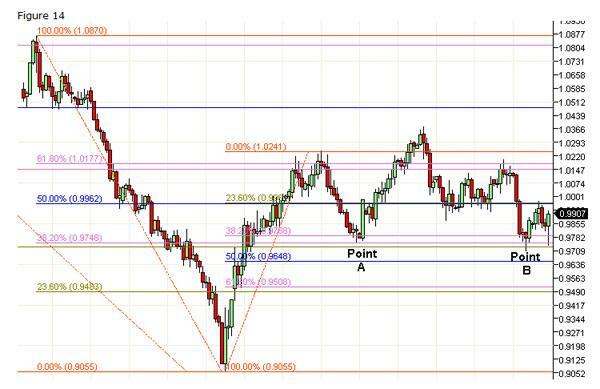 In fact some would have taken profit at the 23.6% Fibonacci Extension level. I believe that taking profit at any of the levels would have been a prudent strategy. Now letâ€™s look at the final entry point from our Figure 7 example. This trade was by far the most troubling. Even the correct entry could have been painful. 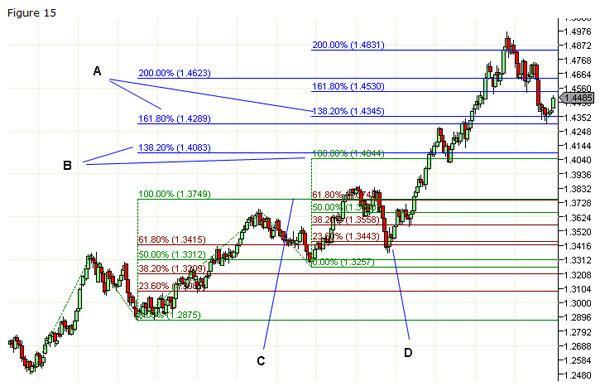 However, if you did stick it out, there were multiple exit points based on the Fibonacci Extensions.